Physically, we’re still in Chicago. Emotionally, we’ve been in Panama City Beach every day and night since Hurricane Michael landed. Every day, and far into the wee hours of many nights, has been spent checking with and on family and friends and learning as much as we can about what’s going on. The short story is, WE got lucky. Most importantly, as we said in a previous post, Johnnie’s Dad is OK. Our home is west of the Hathaway bridge, in Panama City Beach. While there was/is some damage and resulting power/water outage problems, overall, life in that area, particularly the west end, will return or be returning to a semblance of normalcy reasonably soon or in the foreseeable future. The tree that came down in our front yard has been taken care of. To get to it, the power company had to remove an additional tree that we’d planted years ago with Steve’s Dad. Our neighbors from across the street have just returned to PCB and tell us that, other than a little damage to a shed, our car and the expected debris in our front and back yard, from what they can see, our little yellow house appears to be OK. Hopefully, we’ll get to see for ourselves when our, once again, rescheduled flight lands in PCB, next Sunday. East of the Hathaway Bridge, in Panama City, Lynn Haven, Callaway and escalating significantly as you go farther eastward to places like Mexico Beach and Port St. Joe it’s a completely different story that, in some cases, resembles a war zone with areas and, more importantly, lives that have been forever changed. All 3 of our local TV stations, WJHG, WECP and WMBB were knocked off the air. Personalities from those stations, including WJHG’s Chief Meteorologist, Chris Smith, who joined us on Nick Digilio’s show on WGN before the storm hit, have been re-defining what it means for a broadcaster to serve your local community as they have continued to report through Facebook live, Twitter and other social media platforms using their cell phones, laptops or whatever forms of communication they could cobble together. WKGC-FM, in Panama City, the radio station we work with when we’re on the gulf coast is the only Public Media/Radio station located inside the Bay County Emergency Operations Center in their backup facility and has been delivering breaking information on Hurricane Michael aftermath and search and recovery operations. Speaking of WKGC-FM, the worlds first totally solar truck is gone, another of Michael’s victims. We were 2 of the 7 people who ever had the privilege of driving it for a Video Road Test project we were working on with WKGC-FM and Gulf Coast State College. What’s left of the world’s first solar powered truck. In many cases, due to lack of cell phone, Internet and cable, we have more information about what’s going on along the panhandle than some of our friends living there do. We’ve been doing our best to funnel it to them. Many of our friends have had severe damage to, or lost, their homes. Some have also lost their jobs. Because of catastrophic damage along the panhandle, it will take weeks, months or even years for some areas to recover. Some may be beyond repair. Sadly, lives have been lost too. 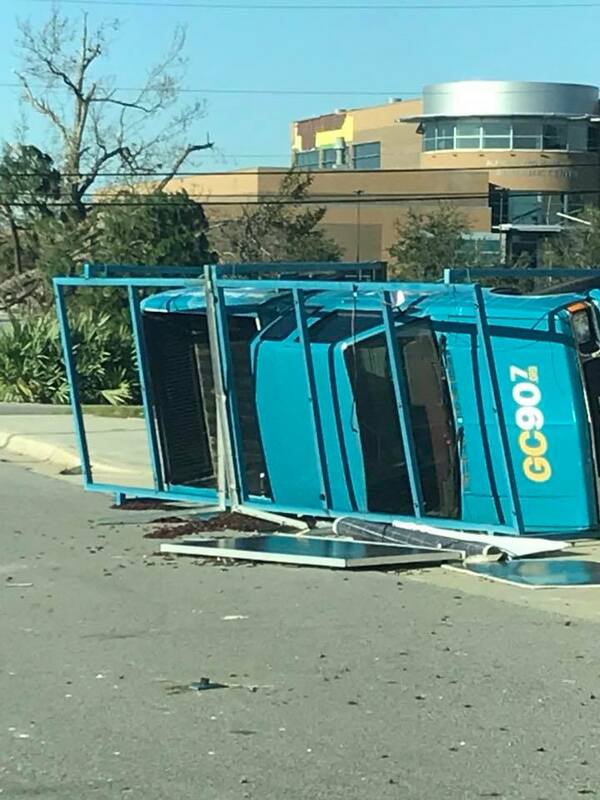 And, both major hospitals in Panama City, Bay Medical Sacred Heart and Gulf Coast Regional Medical Center have evacuated patients due to heavy damage from Hurricane Michael. Bay Medical Sacred Heart did just announce that their Beach ER will be open 24/7! As we’ve been watching from our vantage point, 1000 miles away, even at this distance, we can’t help but be touched by the spirit and resilience of the panhandle’s people. A Facebook poster may have put it best when she shared this and we’d like to share it with you. 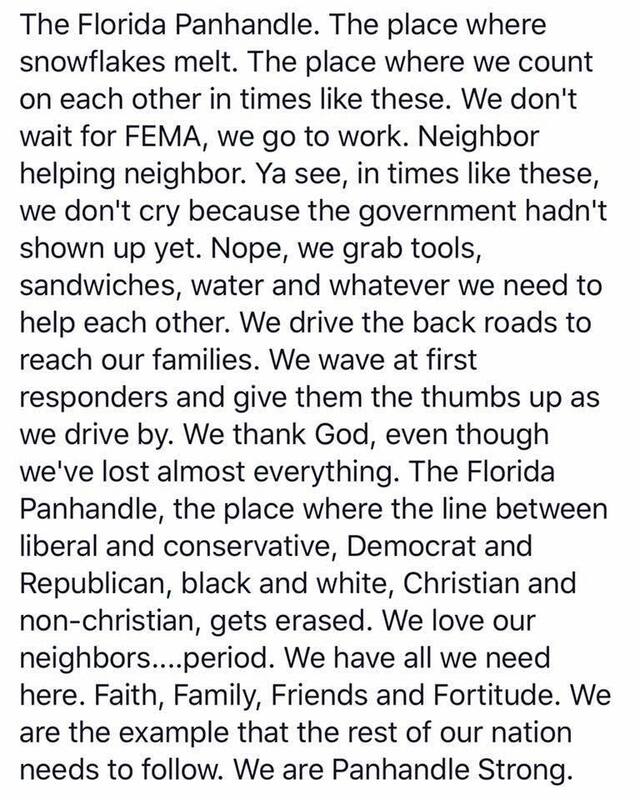 This entry was posted in Hurricane Michael, Partly Personal, WKGC and tagged Bay County Emergency Operations Center, Callaway, Chris Smith, Florida's Gulf Coast, Gulf Coast State College, Hathaway Bridge, Johnnie Putman, Life After Dark, Lynn Haven, Mexico Beach, Nick Digilio, Panama City, Panama City Beach, Port St. Joe, Powel Broadcasting, Radio Insight, Steve & Johnnie, Steve and Johnnie, Steve King, WECP-TV, WGN, WGN AM, WGN Radio, WJHG-TV, WMBB-TV. Bookmark the permalink. Thank you for the update. The post from Facebook was excellent and the true picture of what people do when things like this happen. The most important thing to keep in mind is have patience. Things can be rebuilt and replaced. People cannot be replaced. While I am still waiting for repairs from Irma, I am still here and I still believe we can and should stop arguing while we help one another. Praying for you, Steve and Johnnie, and for your Dad, and for all of those who were affected by Michael. WHEW! Thank you for the update of you and your father. I know this is a tough time but so many prayers are with you and yours. BTW, I love the way you write. Almost as good as hearing your voices!